Your holiday starts as we meet you at Hanoi airport (Noi Bai), and you’re taken directly to your hotel. Enjoy a welcome dinner at the hotel to get to meet the group. After breakfast transfer to the internationally famous Halong Bay. Arriving just before lunch, you’ll embark on a traditional Vietnamese junk. Lunch is served on board as your set sail. Take in the stunning views of the thousands of limestone karsts which amazingly rise from the clear emerald water. The limestone karst formations are littered with beaches, grottoes and beautiful caves, some of which you’ll visit. Overnight on board in Halong Bay. The tour continues with a morning spent cruising on to the Man’s Head, Tortoise islands and then Luon Cave by small bamboo boat. After an brunch check out and continue to travel though Bai Tu Long to Bai Chay for disembark, meet the driver and guide to transfer you back to Hanoi. We arrive in Hanoi in the right time to enjoy a cyclo ride through the old quarter and a water puppet show in the front of Hoan Kiem lake. Overnight in Hanoi. After breakfast at hotel, you are followed by a full day city tour starting with the Ho Chi Minh Complex, containing the mausoleum of the nation’s founder Ho Chi Minh, the Presidential Palace, Ho Chi Minh’s house on stilts. 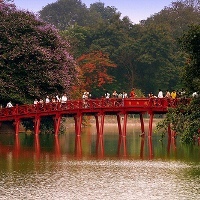 Close to this site is the One Pillar Pagoda, whose origin dates back to the foundation of Hanoi a thousand years ago. Your tour of Hanoi continues with a trip to the remarkable Temple of Literature, well known as Vietnam’s first university. Then we will transfer to airport to take flight to Hue. 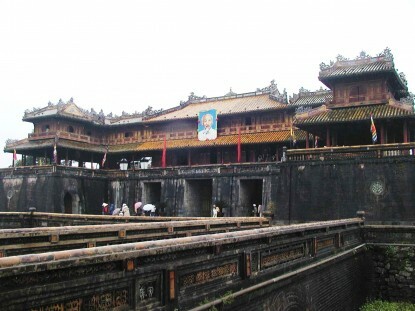 In the afternoon, you will be met at hotel to take a short drive to explore the massive Hue citadel built in 1832 followed by Western architecture combining with Eastern citadel containing the Imperial City and the Purple Forbidden City. This Royal Residence was destroyed during the 1968 Tet Offensive but with renovating by a great work of local artist will hold you back to know more about Nguyen dynasty. The ancient architecture of Hoi An is a fascinating combination of Vietnamese traditional buildings with Chinese and Japanese influence. There’s plenty to see in this delightful town, some of which are the famous Japanese Covered Bridges, Pottery Museum, 200 years old Tan Ky House, Chua Ong Pagoda and vibrant market. Today we include these on a walking tour past many low tiled houses scattered along the small streets and assembly halls, which reflect the town's multi-cultural past. 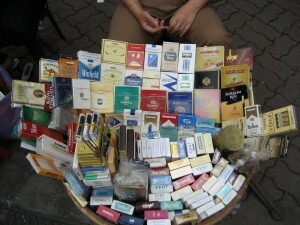 You’ll understand why many visitors come to Hoi An again and again. In spite of the beautiful setting, many visitors site the food as the highlight of their trip to Hoi An – ask your guide for a recommendation! An early morning transfer to Danang airport for a short flight to Ho Chi Minh City. On arrival you'll guided round of some of the most important attractions in Ho Chi Minh City, beginning with the Reunification Palace, which was the former residence of the Southern Vietnam President until the end of April 1975. Close to the palace are some striking French colonial structures including the Notre Dame Cathedral and the Old Saigon Post Office. You'll also visit the Jade Emperor Pagoda, one of the best examples of Taoist temples in Vietnam, and the War Remnant Museum. 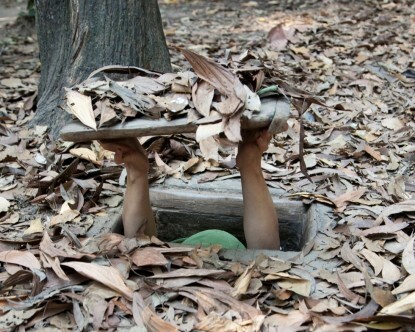 After an early breakfast you’ll avoid the city heat to visit the Cu Chi Tunnels, an incredible underground network constructed by Vietnamese fighters during the long struggle for independence. The tunnels contained hospitals, plus accommodation and schools, and were used as a military base for the Viet Cong in the American war. Afterwards, you'll continue to the headquarters of Cao Dai religious sect which is located in Tay Ninh. This religion was founded in 1923 and now numbers over 2 million members. It’s an unusual religion with an eclectic mix of different saints from different religions, and has Victor Hugo and Charlie Chaplin as patron saints. 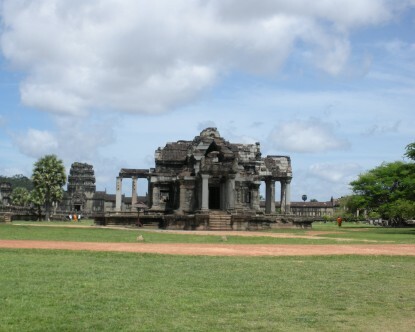 Visit Angkor Thom - The fortified city of Angkor Thom covers an area of 10 square km. Enclosed by a wall and wide moats, the city includes many of Angkor's most popular sights. Enter by the monumental South Gate over a causeway lined on either side by statues of demons and gods, each carrying a giant naga. Continue to the Terrace Of The Elephants and the Terrace Of The Leper Kings, former spaces for public ceremonies. Visit the ruined Baphuon, Royal Enclosure and Phimeanakas before continuing to the mysterious Bayon Temple. In this temple, one of the most popular and compelling in Angkor, explore the galleries of beautifully preserved bas relief and ascend narrow stairs to reach the central sanctuary, where you will find giant stone faces smiling enigmatically down at you from every angle. Visit Ta Prohm - one of the most popular attractions of Angkor as much of the jungle has not been cleared and it looks very much as most of the Angkor monuments would have appeared when European explorers first stumbled across them. Finally, visit Phnom Bakheng - a hill that provides one of the best views of Angkor Wat. Visit Preah Khan - a temple built by King Jayavarman VII with towered enclosures and shoulder-hugging corridors in a jungle setting. Preah Khan covers a very large area but the temple itself is enclosed within a rectangular wall of around 700 by 800 meters. Journey through local villages to Banteay Srei – ‘Citadel of the Women’. The most intricately carved temple in all of Angkor. This pinkish hued temple is adorned with beautiful, deep carvings and often leaves viewers amazed at its detail. Learn the stories behind this masterpiece and capture some incredible photos. Embark on an excursion to the Tonle Sap Lake (Great Lake) with boat trip. Located in the heart of Cambodia, this extraordinary lake swells up to seven times its original size during the monsoon season. Its ecosystem is one of the richest and most diverse in the region. This boat trip will explore the floating fishing villages that live at the edges of the lake, passing submerged forests and fishing farms. Spend the afternoon shopping in the various markets and shops in Siem Reap with transport available to carry all those souvenirs.